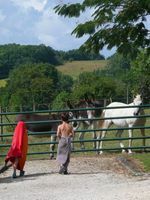 At LAUZANAC, we propose the Cottage Le Pigeonnier for long stays, generally between September and June of each year and depending the rentals already done. In that case, the weekly price becomes a monthly one. * Rates long stays are applicable for stays of at least 8 consecutive weeks. * Long stays can not exceed a 3 month period but may be renewed for 3 more months. Eymet Medieval village is at 5 min: The traditional market takes place each Thursday morning, on the beautiful square. From 2 years old until 15. We live on site so can help with arrangements, sort out problems, make phone calls etc if required. We will consider any length but please note NO PERMANENT LETTING. Please get in touch to discuss your requirements. We are in the countryside and a car is essential. We accept pets under condition. 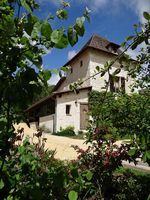 The Eymet Guide website is very helpful to prepare your long stay at Lauzanac cottages. All you need to know about Eymet and the area. Long stay for 2 to 8 persons with 4 bedrooms, 1 bathroom and 2 shower-rooms. PETS: We accept pets under certain conditions. Not more than two, either cat or dog, for a fee of € 5 per night and per pet. From September to June: € 1210 per month (€ 40 per day). All charges included. See details below. Conditions of booking for long stay at Lauzanac cottages. All charges included: electricity, water, central heating, wood for the stoves, Internet access (high speed) and tax for the village. The bed linen and towels are provided at the beginning of the stay. Rates long stays are applicable for stays of at least 8 consecutive weeks. Long stays can not exceed a 3 month period but may be renewed for 3 more months. Both of our cottages are available between September and June of each year subject to existing bookings.